A new modelling platform — at least new for me — arrives later today. The Helix Line 6. I opted for the floor model and not the Helix LT primarily because I needed the extra I/O that the floor provides. I have been running a Fractal AX8 for the past year or so. The units from Kemper, Helix and Fractal are all capable of producing good tones and I have owned both Kemper and Fractal. 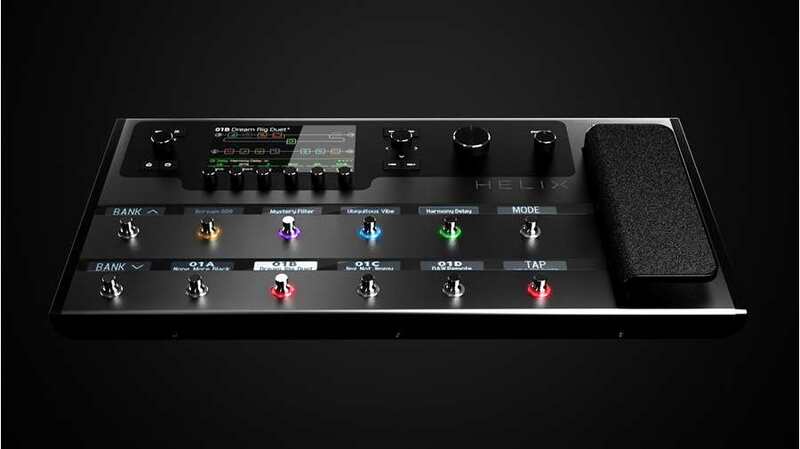 Helix has an advantage in workflow over the Kemper and the Fractal. The Kemper seems to have gone nowhere with respect to editing software and the Fractal’s software, while excellent, requires both a computer and the AX8 to work out tones effectively. The lack of scribble strips on the Fractal AX8 is a bit of an issue for me. Probably the bigger issue though is the lack of DSP on the Fractal AX8. I am constantly bumping into the limits of the DSP with only 6 to 8 blocks active. I spent untold hours previewing profiles on the Kemper. I spent hundreds of dollars on commercial profiles trying to find that sound on the Kemper. I found the unit to be overly difficult in terms of the workflow and I was spending hours tweaking presets for songs. For me, I need a portable, do everything rig for travelling. One that I can quickly pull some good tones together without needing to use a computer. Kemper and Fractal might have a slight edge in tone with their platforms but in the context of a mix, I doubt that very many listeners would be that discerning. I have been using Helix Native with my Pro Tools rig so I have a very good sense as to how the Helix floor will sound relative to the Kemper and Fractal and I have already worked through a lot of the tweaking that is necessary on the Helix to produce a good tone. I am looking forward to getting some presets going over the weekend. Improving your guitar skills may be on your list of objectives for the year. When I started playing, which was before the Internet, it was challenging to find a good guitar teacher and to find resources to help me improve my skills quickly and efficiently. The online world offers so many resources for guitarists. There really is very little reason to remain stagnant. Passion and commitment. That is all it takes to get better at pretty much anything in life. I had not come across Claus Levin before nor had I visited the Guitar Mastery website. I am going to try a couple of his courses and see what they are like. There are some soloing techniques that look interesting to me and may give my improvisation skills a bit of a kick in 2019. This was the video that connected me to the Guitar Mastery website. Claus is a uniquely persuasive communicator and a great player. My guitar rig from a couple of years back. 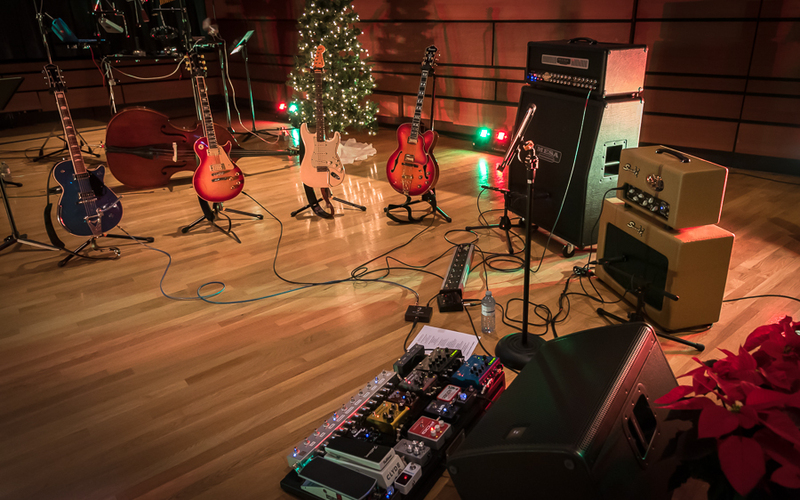 Guitars, amps and pedals galore. 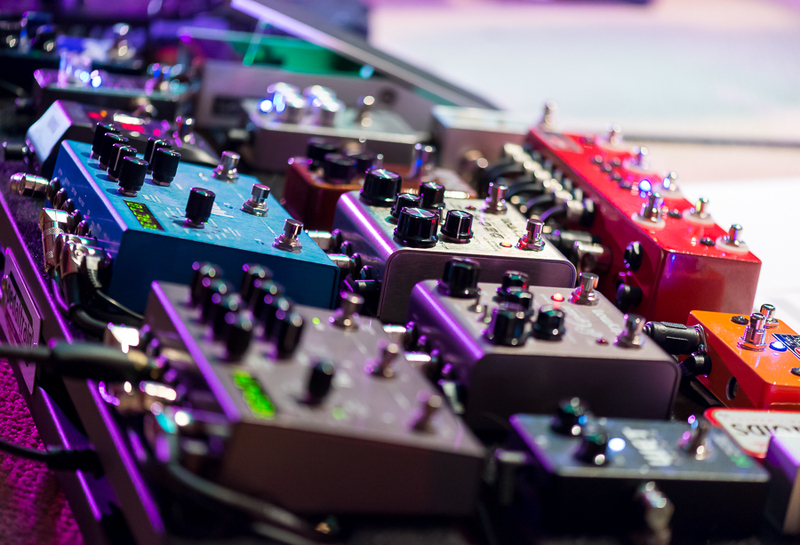 Reverb recently published their list of the best selling pedals of 2018. I would take the list as it is. An attempt to summarize new and used sales of pedals. It might be representative of the overall market or it might not. For example, there are no BOSS pedals on this list and I suspect they are still selling large numbers of pedals. I have owned 8 of the 15 pedals on this list. I guess I should be buying a few new ones now. Electro-Harmonix is still knocking it out of the park with the Canyon, Soul Food and Big Muff. Sweetwater did an interview with Mike Matthews, founder and CEO of Electro-Harmonix. Fun to watch as Matthews is definitely a bit of a unique character. And I learned a few things about the company that I did not know (e.g., they own a Russian tube factory, they went bankrupt, they still assemble and quality check in the United States). The gap between the sound of a tube amp and a modelled or profiled amp is almost too close to call these days. The benefits of a modeller over a tube amp are pretty compelling particularly if portability is important. ML Sound Labs posted this video comparing the sounds between a Mesa, Fractal, Helix and Kemper and, to be honest, the sound was very close to my ear. Not my style of guitar playing, however I have played Mesa amps for over 40 years and the tones in this video are surprisingly close to the real thing. https://www.richardcleaver.com/wp-content/uploads/2015/02/rcdotcomlogo.png 0 0 Richard Cleaver https://www.richardcleaver.com/wp-content/uploads/2015/02/rcdotcomlogo.png Richard Cleaver2018-12-17 09:05:202018-12-19 16:13:17Too Close to Call? So many guitars. So many pedals. So many amps. Before the great retirement purge, I had so much gear. I still have gear but significantly reduced from before. I have become more of a rightsized guitarist. I’m travelling out of the country now with two guitars and a Fractal AX8. Seems to cover most of what I need in a guitar rig. But I do miss the big pedalboard pictured above. Jim Lill just put out a great video — he always does great videos that guy — on all the parts of a pro guitar rig. With a Nashville slant. A few of my favourites get called out but he doesn’t have the most important delay pedal of all time on his board. The Strymon Timeline! I don’t usually work on other guitars. After all, I am not a luthier or a guitar tech. But, with owning many guitars and interacting with some great techs over the years, I have a pretty good handle on the basics. I’ll be setting up a Squier Jaguar Bass later today. The instrument seems to be in fairly good shape. That said, there is a lot of oxidation on the frets. The fretboard is dried out. The action is high. And the strings are really old and worn. Scotch green masking tape in two sizes: half-inch and quarter-inch. The tape is used to mask the fretboard when polishing the frets. 1,000 grit sandpaper (or higher) for light sanding of the frets. 4-zero (#0000) steel wool for polishing the frets. Murphy’s Oil Soap to provide a bit of lubrication when using the steel wool. Dunlop Lemon Oil to treat the fretboard. Micro-fibre towels for cleaning and polishing the instrument. Capo to help with truss rod adjustment. A feeler kit or, at least, one .015 and one .022 feeler to test/make appropriate adjustments for truss rod adjustment and neck height adjustments. Precision steel ruler for measuring down to one-thirty second of an inch. Files for adjusting the nut height. Allen wrenches for adjusting the truss rod and bridge saddles. String winder for changing strings. Wire-cutters for clipping excess string length. Extra cables, batteries and tools for the just-in-case. I will remove the strings. I will then clean the body with a guitar polish from Dunlop. I will examine the instrument for any signs of excess wear or damage that might impact playability. I will tape the fretboard and begin by polishing the frets. A light sanding followed by fret polishing with the steel wool. I will clean off any excess material on the fretboard and then remove the tape. Then it is time to condition the fretboard and clean off the excess. Restring and tune. On this instrument the truss rod adjustment is made from the top of the neck just at the headstock. I will insert the Allen wrench first without making any adjustments. Capo just before the first fret. And then I will press the fret where the neck meets the body. Then I will check the neck by using the .015 feeler midway — usually at the 7th fret — to determine gap. If the string lifts up when the feeler is inserted on top of the fret, then the truss rod is too tight and needs to be loosened. A slight counter-clockwise turn, just a quarter-turn, and check again. If there is a gap then the truss rod is too loose and needs to be tightened. Again, very slight turns otherwise you may cause significant damage to the instrument. A little turn goes a long way. For this instrument, the low E should have a gap of 4/32 of an inch at the fret where the neck meets the body. The other three strings should descend very slightly until the G string is at 3/32 of an inch. Each string has a saddle and there are two screws for each saddle on this particular instrument. Raise or lower both of them as required. You might want to get a tech involved if you are not comfortable filing down the nut of the instrument. Basically you want to use your .022 feeler at the first fret and the string should rest on that feeler. There should not be a gap. If the string is pushed up by the feeler then you may need a new nut. For each string, tune the open note to pitch and then fret the octave (12th fret) and check tuning of the octave note. If the octave note is sharp then the string needs to be lengthened. If it is flat then the string needs to be shortened. This is accomplished by the screws at the bottom of the bridge assembly. Elixir has a good set of videos in terms of setting up a bass guitar. You can find at least one of them here. They have the rest of them up on their YouTube channel which is here. 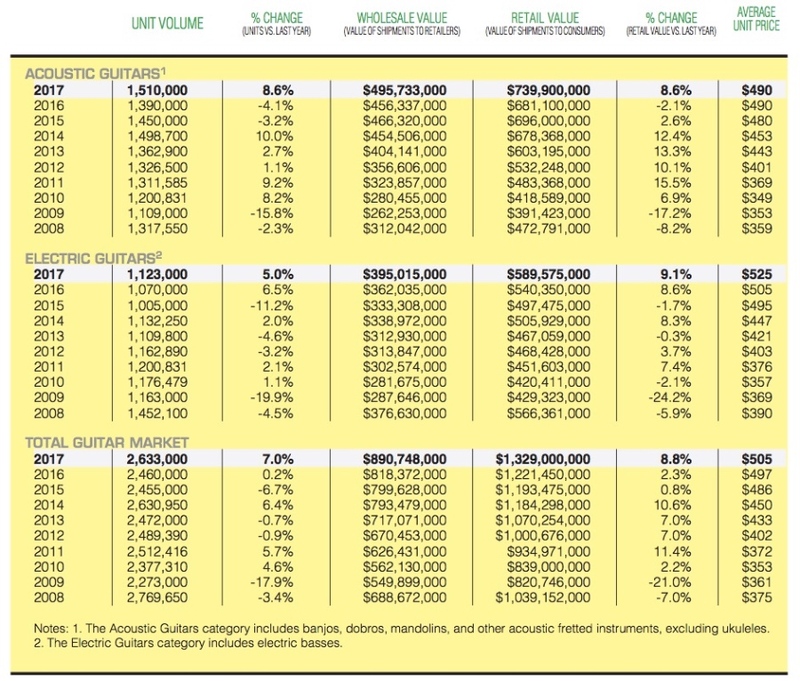 Some interesting statistics on guitar sales. Last year, the Washington Post carried a story on the death of the electric guitar. 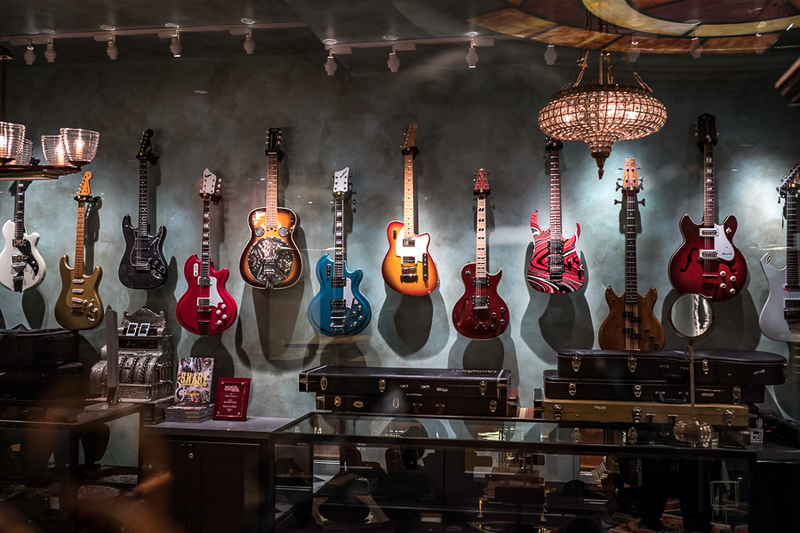 The various retail reports that I have read show a steady decline in the sales of electric guitars down from about 1.5 million in 2008 to just over 1 million in 2017. Acoustic guitars, on the other hand, have seen a rise in sales, about a 15 percent growth since 2008. The market leaders, Fender, Gibson and Taylor, still dominate in terms of sales volume although Gibson has gone through some tough times. Gibson filed for bankruptcy protection in May of 2018. The folks at Fender told me about a new series that they are producing called the American Performer. They really covered the bases in terms of marketing on the web. There is coverage everywhere on this product launch. Handcrafted in Corona,Â Calif.,Â the American Performer Series elevates the standards of performance-grade instruments for artists, makingÂ deliveryÂ seamlessÂ on stage,Â soÂ playersÂ can focus on their art and sharing that in its finest form.Â FeaturingÂ 98Â SKUs, theÂ AmericanÂ Performer Series brings theÂ Jazzmaster, Mustang and Mustang Bass intoÂ theÂ US-madeÂ line in theÂ $1,099.99 – $1,199.99Â price range.Â After listening to direct feedback from artists, productÂ developmentsÂ focusedÂ onÂ creating solutionsÂ for performers. New features include:Â Yosemiteâ„¢Â pickupsÂ officially introduced for this line;Â patent-pendingÂ DoubleTapâ„¢Â humbucking pickups;Â ClassicGearâ„¢ tuning machines;Â special circuitryÂ andÂ enhanced electronics; a 70s style logo in silver on allÂ models; anÂ oversized â€˜70s headstock on Stratocaster models,Â as well asÂ fiveÂ brand-newÂ glossÂ colors and two satin finishes. Guitar Center put up a video covering the American Performer Tele. The Strat, pictured above, is my favourite given the limited colour choices for that model. That said, I am not a particular fan of the 1970s style headstock. These are not custom shop instruments mind you. You buy them off the rack as is for a reasonable price. Nice to see them being made in California. You can take a look at the series on the Fender storefront here.